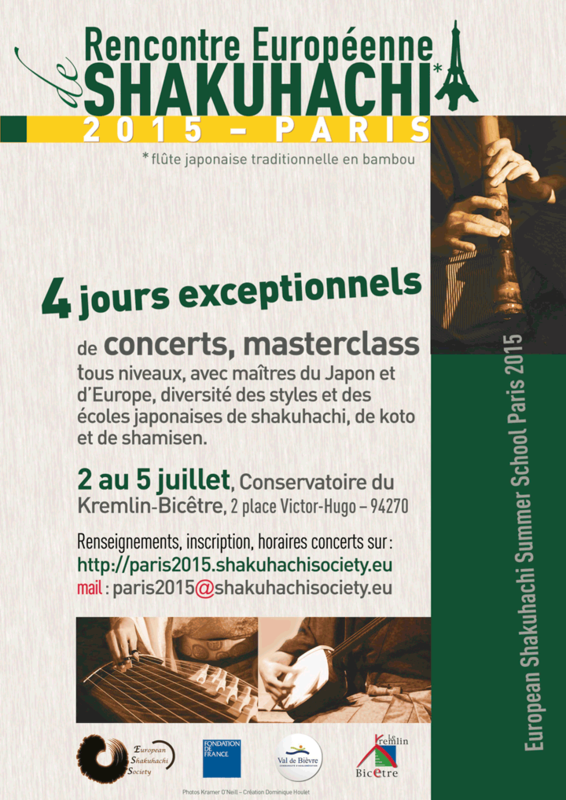 The European Shakuhachi Society Summer School 2015 will be held in Le Kremlin- Bicêtre on the outskirts of Paris, from the morning of 2nd July to the late afternoon of 5th July. An opening concert is also planned for the evening of July 1st so please keep an eye on this website which is updated regularly. Paris is certainly the most Japanese of European cities and the shakuhachi is not left out; the communicative passion of musicians such as Daniel Seisoku Lifermann (La Voie du Bambou) or Sōzan Kariya (Shin Tozan-ryū France) has created a diverse community of shakuhachi players. Thanks also to Véronique Piron (KSK) who has been teaching in Paris for many years, and occasionally but regularly Gunnar Jinmei Linder (Chikumeisha), Fukuda Teruhisa (Hijiri-kai), and Furuya Teruo (KSK), this community is the home of high quality of teaching in a variety of styles. For this first Summer School in Paris, we have decided to highlight one of the most important schools of shakuhachi in Japan, the Tozan school. Taizan Kawamura, first disciple of Hozan Yamamoto and professor at the National University of Fine Arts and Music of Tokyo, and his son Kizan Kawamura, have honoured us with accepting our invitations to teach and perform. European teachers will also be joining: Gunnar Jinmei Linder (Chikumeisha), Wolfgang Fuyūgen Hessler (Chikuyūsha), Véronique Piron (KSK), Daniel Seisoku Lifermann (Hijiri-kai) and Jim Franklin (KSK, contemporary music and improvisation). We particularly appreciate that the Swiss Shakuhachi Society (Shakuhachi Gesellschaft Schweiz) will be joining this event so that Wolfgang Hessler and Gunnar Linder will be able to offer you a comparison between the Chikuyūsha and the Chikumeisha styles, two important branches of the Kinko school. Moreover, thanks to the presence in Paris of Mieko Miyazaki, Fumie Hihara and Etsuko Chida, we will be able to present different aesthetic currents of the koto, especially the Yamada school. Mieko Miyazaki and Fumie Hihara will also teach koto and shamisen. Le Kremlin-Bicêtre is a city of 26,000 inhabitants whose history is particularly linked to the French Revolution and the labour movements of the early 20th century. At the beginning of the 14th century, the castle built by Jean de Pontoise, Bishop of Winchester, took the name of ‘Winchester Castle’ but this name, barbarous to French pronunciation, suffered a number of distortions and became successively Vincestre, Bichestre, Bisestre and finally Bicêtre. The ’Sergeant of the Kremlin’, an ancient tavern which no longer exists, gave the other half of the city its name. 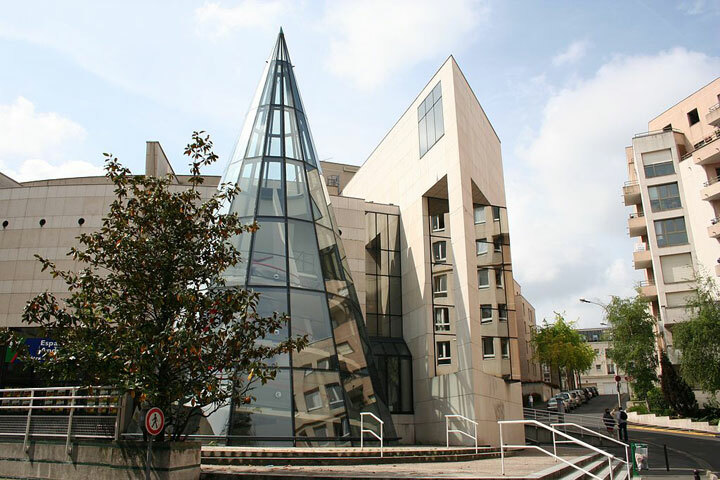 Le Kremlin-Bicêtre is adjacent to the south of Paris and is very well served by public transport (metro, bus, tram). The metro line 7 links it to the center of Paris in about fifteen minutes. Most of the classes will be held at the Conservatory of Music, Dance and Theater, where we will benefit from spacious rooms and good facilities (chairs, desks, pianos…) The concerts will take place in two halls of the city: the auditorium ’L’Echo’, a brand new hall 5 minutes walk from the Conservatory, and the beautiful Council Chamber of the City Hall. As usual, a concert will take place every evening with free admission for the participants of the Summer School. A choice of affordable accommodation is already listed on this website. Le Kremlin-Bicêtre is easy to reach by public transport, either from the airports or train stations in Paris. If you come by air and have a choice, Orly Airport is much closer than Charles de Gaulle airport. The fee for this Summer School includes lessons, workshops and concerts, but not accommodation, meals or transportation which you need to book yourself. Booking for the Summer School has been opened since February. We hope to see you all in Paris!